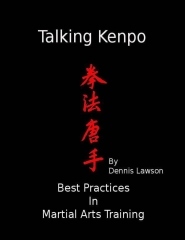 During a recent study session, I started thinking about the significance of Ed Parker’s Kenpo reference materials. We are fortunate to have so many principles, theories, study aids, terms, basics, etc. written down for us in Mr. Parker’s books and manuals. In these articles, I wanted to highlight what I consider to be the Key Study Aids. I consider these the most significant for developing good self-defense skills. They are: Analysis of Motion, Cycle of Considerations, Equation Formula, Zone Theories, Web of Knowledge, and the Universal Pattern. These training aids can be used by any Martial Art or Self-Defense system. They can be applied in other areas of life to understand, learn, or teach various topics. This article will explain both the Analysis of Motion and the Cycle of Considerations. Later articles will cover the other aids in detail. The Analysis of Motion was designed to familiarize students with all aspects contained in, or affected by, motion. It is arranged in a sequential order of priority. Analysis is comprised of: Direction, Method, Path, Dimension, and Angle. Using a Baseball analogy as an example, the pitcher may throw the baseball in the direction of the batter at home plate which is in front of him. He could also throw with the intent of catching the runner stealing second base, behind him. He might throw to first or third base to either side of him. He may throw the ball in a circular (curve, slider) or linear (fast ball) method. From the top of the pitcher’s mound he is above the other bases and especially the catcher, at home plate, who squats below the batter to control any wild pitch. When throwing toward home plate the height of the mound makes the path of the pitch downward and diagonal. The speed and method of the pitch would affect the dimensions of height, depth and width and how quickly these are traversed. The angle at which the pitcher releases the ball would determine which type of pitch he was throwing, and what type of pitch the batter may think he is throwing. Cycle of Considerations – Incorporates the 9 basic elements of any conflict. Skip Hancock created this visual training aid to help students study the nine basic elements of fighting. To increase your chances of survival or victory you must consider them in their exact order: Attitude, Environment, Dimensional Stages of Action, Positions, Maneuver, Target, Weapon, Angle, and Cover out. The Cycle of Considerations expanded on the Preparatory Considerations listed in Ed Parker’s Infinite Insights Volume 1 --- Mental Stimulation. Many studios around the world train a model (self-defense technique) through all 9 elements using a prescribed self-defense scenario. You can use this to study any scenario-based self-defense exercise in any martial arts style or system. Looking at a modern day Mixed Martial Arts match you could use the cycle to define and develop the fighter’s strategy. The striker’s attitude might be to win the fight by knock out. The environment is limited; determined by the rules of the match. The rules require one referee and two fighters, so there are no concerns of hidden weapons or multiple attackers. The ring is pretty clear of anything that could influence the fight. Other than the possibility of sweat and blood on the training surface, it is pretty sterile. The DSA (Dimensional Stages of Action) would be how close or far the opponent is from our fighter at any point in the match. For the purpose of our strategy, the opponent is about a half step (Within Contact near Contact Penetration) from our fighter. Our fighter studies these specific positions in the ring that can be adapted to his knock out scenario. In this example, the opponent is upright in a fighting stance with both feet forward and does not have his targets minimized. Due to his training, our fighter knows he doesn’t need to maneuver to close the distance and set up his knock out strike. The next three items on the cycle are Target, Weapon and Angle. Our fighter sees the front leg is open (target) and knows that striking it will take his opponent’s attention from his next two shots. He picks the best weapon (instep of the foot) for the leg kick and calculates the best angle to deliver his kick without telegraphing the movement. At this point our fighter delivers a low instep kick off the rear leg, a right upper cut off the lead hand to the opponent’s solar plexus and follows with a roundhouse punch off the rear hand to the jaw which knocks the opponent out. The referee stops the fight so our fighter uses the Cycles lesson of cover out to maintain control and distance, retreating to a neutral corner until the victory is announced. After a quick count to ten by the referee, our fighter has his knockout victory. A grappler’s strategy for winning the fight may be different, but the Cycle of Considerations would be the same. His attitude may be that he will submit his opponent by using an armbar. The ring, rules, etc. are the same; therefore, the environment is the identical for both the striker and grappler. The DSA (Dimensional Stages of Action) would again be how close or far the opponent is from our fighter at any point in the match. For the purpose of our strategy, the opponent is about a half step (Within Contact near Contact Penetration) from our fighter. Our grappler will need to close the distance past Contact Penetration range into Contact Manipulation range in order to make his strategy work. Due to his training, our grappler knows he will need to maneuver to close the distance and set up the position for his finishing move. The grappler works the next three items on the cycle, Target, Weapon and Angle, just as the striker did. Our fighter sees the front leg is open (target) and knows it will take his opponent’s attention from his next moves. He picks the best weapon (instep of the foot) for the leg kick and calculates the best angle to deliver his kick without telegraphing the movement. At this point our fighter delivers a low instep kick off the rear leg. He follows the strike with a single leg takedown using his rear hand to grab the same leg. Working quickly to take advantage of his new position, he maneuvers himself on top of his opponent. The opponent attempts to cover up. Our grappler takes advantage of the opponent’s loss of posture, striking him and maneuvering for a controlling position. Our grappler controls one of the opponent’s counterpunches at the elbow. This is sufficient for him to take control of the arm, locking his opponent’s arm with enough effectiveness to force the opponent to “tap out” or suffer a broken arm. The referee stops the fight on the tap. Our fighter uses the Cycle’s lesson of cover out to maintain control and distance, retreating to a neutral corner until the victory is announced. After the referee makes his call, our grappler has his submission victory. The effectiveness of these models is evidenced by the ability to adapt the ideas to other sports (baseball) and different fighting strategies (striker or grappler). This is the real strength of the various principles defined in Mr. Parker’s Kenpo. Principles are universal and flexible. As I stated earlier, these ideas can be applied in other areas of life to understand, learn, or teach various topics.